LEXINGTON, Ky. – Hunter Dreves looked at ease pitching Highlands into the state semifinals Saturday. The University of Tennessee commit threw a two-hit shutout in a 5-0 victory over Paintsville. That sends the Bluebirds (28-13) back to Lexington Friday to meet McCracken County (34-8) at 8:30 p.m.
McCracken County routed both of its opponents this weekend, Campbell County 14-3 and Bowling Green 16-0. Both games were shortened to five innings by the mercy rule. Hazard (26-9) plays Louisville St. Xavier (35-2) at 6 p.m. in the other Friday semifinal. Dreves said he was, indeed, comfortable on the mound Saturday. “It feels good. Your team's behind you. So everything you do, they're going to support you, no matter what,” he said. "But it's a lot better to get a win." A double play helped Dreves get out of a jam in the second inning. 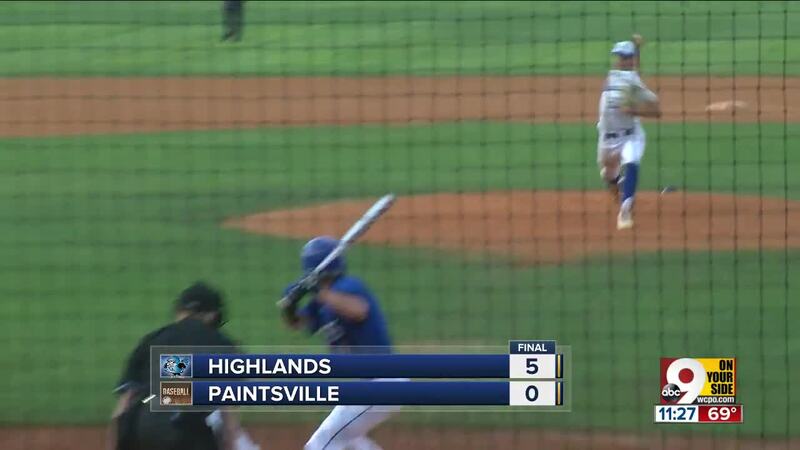 Paintsville had runners on the corners with no outs. Third baseman Sam Hennigan fielded a chopper and threw to first for the sure out, and Tyler Gulley fired home to cut down the lead runner at the plate. In the bottom of the inning, Highlands’ Joe Steiden singled home Grant Summers to make it 2-0. That was all Dreves would need. Drew Rom, drafted in the fourth round by the Orioles this week, pitched a four-hitter in Highlands’ 4-2 win over South Oldham in the first round Friday.